Strawberry is cultivated in sub. Tropical climate. In India it is generally cultivated in the hills. Its main centres of cultivation are Dehradun and Nainital in UP, Kashmir Valley, Bangalore and Kalimpong (West Bengal),Mahabaleshwar (Maharashtra). Strawberry is being cultivated successfully in plains of punjab around ropar,gurdaspur,patiala and ludhiana cities . The strawberry is liked of the small fruits. Strawberry is grown in Europe, in United States, Canada and South America. Strawberry is a good fruit taken fresh in many ways. used in ice cream and Jam on account of its rich aroma, it has big source of vitamin C. It is a soft fruit, often shipped in frozen condition in Western countries. Strawberry grows best in temperate climate.a short day plant which requires exposure to about 10 days of less than 8 hours sunshine for initiation of flowering. The exposure to low temperature during this period helps in breaking dormancy of the plant. In spring when the days become longer and the temperature rises. The plants resume growth and begin flowering. The varieties grown in milder sub. Tropical climate do not require chilling and continue to make some growth during winter. 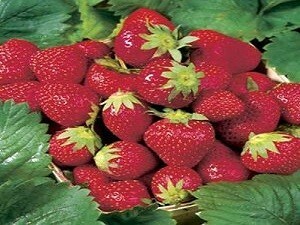 Strawberry requires a well-drained medium loam soil, good in organic matter. The soil should be slightly acidic with pH from 5.7 to 6.5. At higher pH root formation is poor. The presence of excessive calcium in the soil causes yellowing of the leaves. In light soils and in those rich in organic matter, runner formation is better. Strawberry should not be cultivated in the same land for a number of years. It is preferable to plant it in green manured field. Alkaline soils and soils infected with nematodes should be avoided. A big number of varieties are available. For the hilly areas, varieties Royal Sovereign, Srinagar and Dilpasand are suitable. Some of the introductions from California, such as Torrey, Toiga and Solana may prove even more successful. The variety found successful in Bangalore has been named Bangalore and which has performed well at Mahabaleshwar also. For the punjab region plains, Pusa Early Dwarf which has dwarf plants, large firm wedge-shaped fruits, has been recommended. Another variety with rich aroma but softer fruits is Katrain Sweet. Some of the varieties found successful in warmer parts of the U.S.A. are: Premier Florida-90, Missionary, Blackmore,Klonmore & Klondike. Some of these may prove successful for cultivation in Indian plains. The land for strawberry planting should be thoroughly prepared by deep ploughing by harrowing.It can be planted on flat beds, in the form of hill rows or matted rows, or it can be planted on raised beds. In irrigated areas, plantings on ridges is advised. In Mahabaleshwar, the usual practice is to plant on raised beds 4 by 3 meters or 4 by 4 meters. The planting distance should be 45 cm from plant to plant and 60 to 75 cm.from row to row. In the hills, Transplanting is done in March-April, September-October, but in punjab area plains, the months of January-February may be utilized for this purpose. The plants should be set in the soil with their roots going straight-down. The soil around the plant should be firmly packed to exclude air. The growing point of the plant should be just above the soil surface. During planting, the plants should not be allowed to dry out and should be irrigated immediately after planting. The roots of strawberry plants spread out close to the surface. the soil should be well-supplied with moisture, and hoeing should be done lightly and young plantation be kept weed free.